The Kgalagadi Transfrontier Park, located in both Botswana and South Africa, extends over 15,000 square miles (38,000 sq km) of the southern Kalahari Desert. 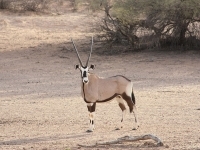 About three quarters of the park lies in the extreme south-west of Botswana, locally known as the Gemsbok National Park. Visitors to the park can witness the fragile balance between migratory animals and their predators in this harsh, semi-arid environment - a real African safari experience. There are campsites available for visitors but other tourist facilities are very limited. Address: Kgalagadi District, about 537 miles (865km) south-west of Gaborone.